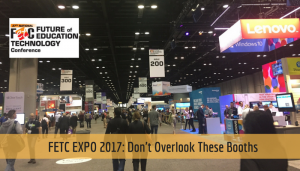 With FETC in full swing, one of the busiest places is the Expo Hall. The amount of booths with hardware, maker spaces, apps, websites, and touch screen displays can be overwhelming. There is a span from start-ups to heavy hitters in the expo hall, all well worth your time. This list just focuses on 4 booths. These booths may not seem to have a lot of big bells and whistles, but have a lot of potential to change instruction with technology in the classroom. Of course this is a small list, feel free to add any other booths you feel are worth mentioning in the comments below. Full transparency: I was not asked, paid, given free products or persuaded in any way to discuss these booths. These are just a handful of ones that I enjoyed learning from. NWA 3D: Ok, full disclosure, NWA3D comes out of Northwest Arkansas, just as I do. I was pleasantly surprised to see them here! I probably am biased with this choice.